Register your kids for a free workshop at Home Depot on Saturday, January 5th. Come in between 9 AM and 12 PM for a hands-on workshop where you and your child can build an easel. 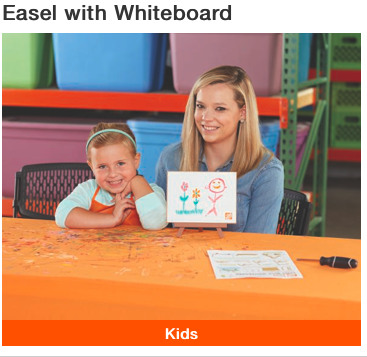 Once your easel is built, your child can decorate it with paint and stickers. All kids get to keep their craft, receive a FREE certificate of achievement, an Apron and a commemorative pin, while supplies last. This entry was posted in Events, Freebies, Kids and tagged event, freebie, Home Depot, kids. Bookmark the permalink.